(2012.201.B2000.0223, Oklahoma Publishing Company Photography Collection, OHS). On November 10, 1939, the first television images were seen by the Oklahoma public in the Oklahoma City Municipal Auditorium. Radio Corporation of America engineers installed and tested the equipment for the planned television demonstration. Officials estimated that fifty thousand people saw the broadcasts between November 14 and November 18, 1939. Sponsors of the extravaganza were the Daily Oklahoman, the Oklahoma City Times, and WKY Radio. In November 1944 a repeat of this successful television demonstration was conducted in nineteen Oklahoma cities as part of a war bond drive. In 1936, at the dedication of the new WKY studios, Daily Oklahoman publisher Edward K. Gaylord promised Oklahoma City that "when television and facsimile transmission are ready for the public, WKY expects to serve you." As a newspaper publisher and owner of WKY radio, Gaylord was prominent in Oklahoma's communications industry. On June 6, 1949, he kept his promise by speaking on the first program broadcasted by WKY-TV channel 4. On November 30, 1949, Tulsa's KOTV channel 6 began broadcasting. Helen Alvarez was the driving force behind this station. WKY-TV and KOTV were on the low band of television known as VHF (very high frequency) channels 2 through 13. Early television sets were only equipped with these channels. If viewers wanted the upper channels, that is, UHF (ultrahigh frequency) channels 14 through 83, they had to buy a box adapter for the set. In early years Oklahoma City and Tulsa had UHF stations. However, because they had significantly fewer viewers than the VHF stations, they were short lived. Without an audience, there was little advertising and less profit. 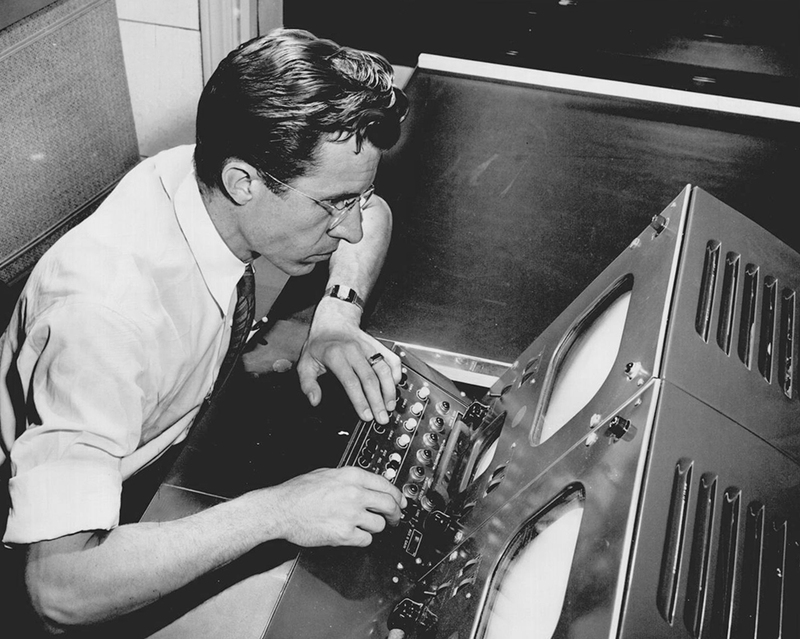 In the late 1940s the Federal Communications Commission (FCC) placed a "freeze" on station applications until a frequency allocation plan could be established. Owners had to wait several years before they could apply. Once the FCC had finished their work, the stations started coming on line in rapid succession. In Lawton KSWO channel 7 signed on the air March 1, 1953, with its first program on March 8. KWTV channel 9 in Oklahoma City came on the air on December 20, 1953, followed by KTEN channel 10 in Ada on May 3, 1954, KGEO channel 5 in Enid with regular programming on July 18, 1954, KTVX channel 8 in Muskogee on September 18, 1954, KVOO channel 2 in Tulsa on December 5, 1954, KETA channel 13 in Oklahoma City in April 1956, and KOED channel 11 in Tulsa on January 12, 1959. KTVX moved from Muskogee to Tulsa and changed its call letters to KTUL on September 12, 1957, and KGEO moved from Enid to Oklahoma City and changed its call letters to KOCO in February 1958. At first, programming was either live or projected film. Some network programming was recorded on sixteen-millimeter film and then sent by mail to the station, which would play it in the appropriate time slot. WKY was on the air from 7:00 p.m. to 9:45 p.m. each evening except for Saturday night, when they did not broadcast. That first night of June 6, 1949, WKY offered a thirty-minute live show with welcomes from Gov. Roy Turner, Edward K. Gaylord, Father John Walde, Rabbi Israel Chodus, Dr. Henry G. Bennett, Dr. John R. Abernathy, and P. A. Sugg, WKY general manager. A film on the World War II D-Day landing was shown next. Other programming that evening included Gismo Goodkin Theater (a marionette show), Wiley and Gene (music, a program for teenagers), Ken Wright (organ music), Southern Serenaders (quartet music), miscellaneous talk shows, an NBC tribute to WKY, and a Hopalong Cassidy film. Local personalities on these shows became stars as they entered Oklahoma living rooms on a daily and weekly basis. Danny Williams, Lola Hall, Ida "B" (Blackburn), Don Woods, and Betty Boyd, along with children's show hosts such as Foreman Scotty, Mr. Zing, and Ho Ho the Clown, were accepted as part of the family in viewers' homes. Network cable hookups appeared in the early 1950s, allowing live network feeds to reach Oklahoma. By the middle of that first decade of TV in Oklahoma, live network shows had become commonplace. A schedule for January 31, 1957, listed Queen for a Day, Groucho Marx, Dragnet, the Tennessee Ernie Ford Show, the Lux Video Theater, and NBC News. Oklahoma stations could carry live feeds of political conventions and by 1963 were ready to show the developments in Dallas after Pres. John F. Kennedy's assassination. NBC (National Broadcasting Company), ABC (American Broadcasting Company), and CBS (Columbia Broadcasting System) used special ground lines to each affiliate station around the country. With the launching of the Telstar satellite on July 10, 1962, transmission changed forever. Television signals from any point in the world would be almost instantaneously sent and received via satellite technology. Land lines would eventually no longer be needed, and world news became as much a part of the news scene as local events. Oklahoma Educational Television Authority (OETA) brought instructional programming to the state. The first conference on educational television, held on November 19,1951, directed the Oklahoma State Regents for Higher Education to apply for educational channels. On December 2, 1953, KETA channel 13 in Oklahoma City became the first assigned by the FCC. KOED channel 11 in Tulsa was assigned by the FCC on July 21, 1954. Lacking funds, KETA and KOED did not air until 1956 and 1959, respectively. Under Robert Allen's direction, OETA expanded during the 1970s. It reached virtually the entire state with low-power repeater stations and two additional full-power stations at Eufaula and Cheyenne. New developments came about in the 1970s. UHF broadcasting began in the late 1970s and was temporarily successful. By the late 1960s some television sets began to have built-in UHF channel receivers, and by the 1970s most sets incorporated them. Another addition to the available number of channels came with cable, first introduced to rural communities and then to the urban areas by the late 1970s. Cable channels such as CNN, ESPN, and MTV became popular in American and Oklahoma culture. By the end of the twentieth century small dish satellites and digital cable gave viewers the choice of hundreds of channels. However, after fifty years of broadcasting, local programming continued to maintain a strong hold on Oklahoma viewers desiring local news, weather, and sports. Daily Oklahoman (Oklahoma City), 10 and 11 November 1939, 12 and 19 November 1944, and 20 November 1949. Enid (Oklahoma) Daily Eagle, 18 July 1954. Lawton (Oklahoma) Constitution, 1–8 March 1953. "Television Broadcasting—Oklahoma," Vertical File, Research Division, Oklahoma Historical Society, Oklahoma City. Bill Moore, "Television," The Encyclopedia of Oklahoma History and Culture, https://www.okhistory.org/publications/enc/entry.php?entry=TE005.